Daleys Fruit Tree has Plants for Sale to Lansdowne and can Mail Order them to you door. Click to Find out how much Freight Will Cost. 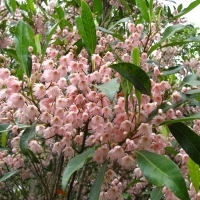 Small upright tree with masses of dainty, pink, fringed bell flowers followed by bird attractive blue berries. Hardy.